We present a new mechanism for the academic community to openly endorse publications. The primary way academics can receive recognition for their work is by being published in specific, well-known journals. This holds back progress in several areas, including rapid dissemination of scientific results, and open access to academic works. 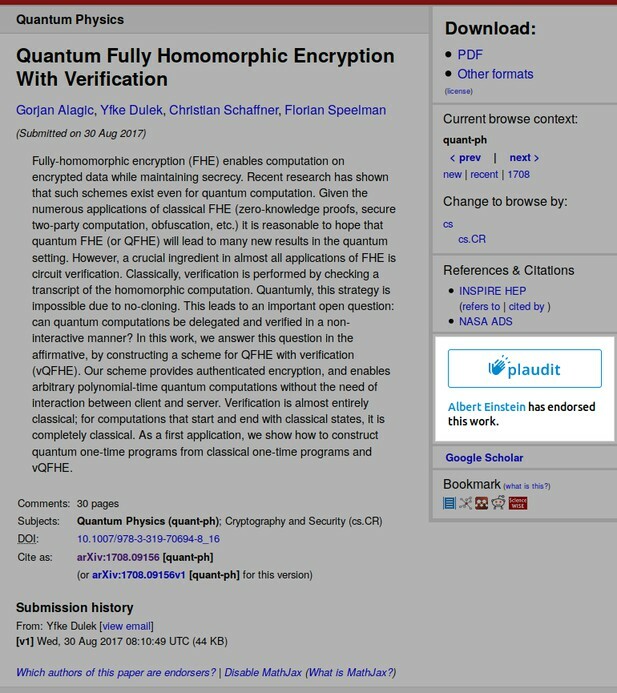 At last year’s Innovation Sprint, a team of researchers, publishers and engineers set out to bring an end to this situation, and prototyped the first version of Plaudit: a mechanism for academics to share their research recommendations openly with readers, in the context of that same research. Late last year, eLife, the Center for Open Science and Flockademic announced that we would develop the concept into a full-fledged product. Now that we are a couple of months along, let’s take stock of where we are. 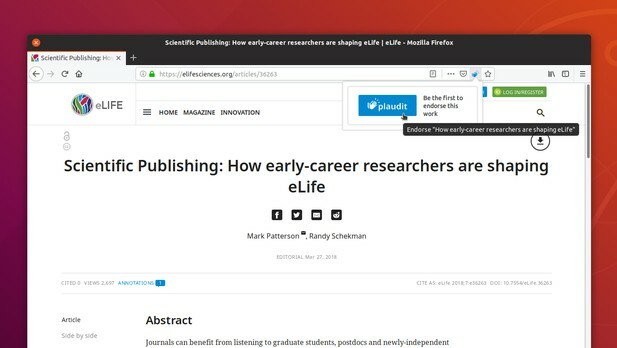 By integrating with different publishing platforms, Plaudit encourages cross-platform research discovery and makes these endorsements relevant to researchers who read research from a variety of sources. We therefore spent a lot of effort to make it as easy as possible for publishers to integrate the widget. If you are a publisher interested in incorporating Plaudit into your platform, feel free to get in touch for further assistance. Furthermore, all endorsements are made available as open data through CrossRef Event Data and we build on open standards like DOI and ORCID. This prevents endorsements from being locked in to a single platform, while promoting accountability. Users can also follow the endorsement links on the widget to see who else endorsed a particular paper (and soon, for what reason) and explore what other papers other users have endorsed. Several improvements are still in development. With support from eLife’s UX team, we have carried out a series of User Experience tests to make sure Plaudit is as easy to use as possible and will be incorporating improvements as a result of our findings there shortly. Finally, we are working to allow endorsers to further specify what they think the strongest features of an article are. This allows people to easily highlight when research was methodologically robust, clearly written, or particularly exciting. Throughout Plaudit’s development, we have worked to make sure that the widget works well even for users with visual impairments. And as with all projects supported by the eLife Innovation Initiative, all source code for the project is open source and publicly available on GitLab. Are you interested in contributing to open-source projects like Plaudit to drive forward open science? Register your interest for the eLife Innovation Sprint in September 2019.